LAS CRUCES, New Mexico - - Despite its grand finale ending with an unexpected bang, the Personal Spaceflight Expo held here today as part of the Countdown to the X Prize Cup was a success, attracting thousands of onlookers who explored space capsules, rubbed elbows with astronauts and watched high-performance rocketry shoot through the sky. They even watched a few mishaps in what is billed as the emergence of rocketry for the masses and public space travel. The whole event, which ran from October 6 - 9, was organized by the X Prize Foundation and hosted by the State of New Mexico. At the expo's end, as fairgoers counted down, Starchaser Industries experienced a failure of its Churchill Mk2 rocket engine. "What we're seeing is not what we were expecting to see," said Gregg Maryniak, Executive Vice President for Education of the X Prize Foundation. "We'll that's exactly what we planned to do," responded Steven Bennett, President of Starchaser Industries of the United Kingdom. 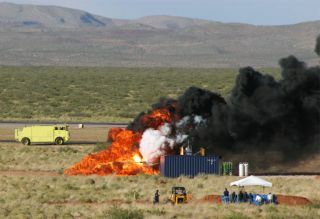 "We wanted to bring the grand finale to the X Prize Cup event, so we thought we'd blow our engine up," he quipped. Bennett said the engine was designed for multiple tests, and the engine had been fired eight times before. "So eventually it was going to go pop. In the world of rocket science you can learn a lot from an anomaly like this," he added. A central star of the show, XCOR Aerospace, demonstrated its EZ-Rocket here at the Las Cruces airport. The vehicle is a precursor to the Mark-1 X-Racer now under development with planned test flights in the spring and summer of 2006. Rocketing off the tarmac, the EZ-Rocket was put through its paces above the expo crowd by former shuttle astronaut, Rick Searfoss. Demonstration flights of the EZ-Rocket signals the emergence of a new Rocket Racing League. But not all rocketry at the Expo went according to plan. Armadillo Aerospace got their rocket-powered, vertical takeoff, vertical landing vehicle off the ground. Blasting off into the sky then hovering for a few seconds, the craft began lowering itself to the ground - but tipped over on touchdown. The wet ground due to overnight rain was the cause, although the craft appeared undamaged in the fall. An internal hose was punctured, however, causing subsequent flights to be scrubbed. The night before the expo, the area was struck by significant winds and rain, causing expo organizers to be somewhat concerned. But as morning came, the weather cooperated, sort of. "The weather's not too bad. We've had a bit of everything this morning...thunder, lightning, rain, fog, sunshine, clouds," said Bennett, leader of Starchaser Industries. Along with several other static displays, Starchaser's three-person spaceship---Thunderstar--attracted long lines of expo visitors to get a personal inside look at the capsule. "What we have to do is change public perception," Bennett told SPACE.com. "There are a lot of people out there that don't believe that space tourism is viable or real. A lot of people think you've got to be NASA or you've got to be a world government to do this kind of thing," Bennett said. "What we're doing here is proving to ordinary people that you can make this happen...and that personal spaceflight is just around the corner." In surveying the sprawling scene of full-scale replicas of spaceships on display, hopeful rocket start-ups, as well as real hardware that's actually flown, the line between reality and hype can sometimes be blurry. "It's not real yet. So it's harder for people to distinguish what's going to be real versus pure fantasy," said John Carmack, leader of Armadillo Aerospace. Carmack said their group has been hard at work for five years, taking a "test-as-you-go" approach. "As always, it takes longer than you expect," he told SPACE.com. "I still don't think even after five years that it's fundamentally that difficult. Yes, it's not something that we turned around in three years. We still haven't spent that much money on it...and we've learned a whole lot. We're back again on the cusp of doing the really high performance flights," Carmack said. The Armadillo Aerospace style has been based on it's "better to build 10 vehicles even if you destroy them" credo. It's a way to learn a lot on the way, Carmack noted, "rather than to spend years and millions of dollars just studying something." For rocketeers and those hungering to enter the personal spaceflight enterprise, Carmack offered a bit of advice. "It's good to try and make things real as soon as possible. You don't want to leave things theoretical and plan it...it's better to step in and do something immediately. If you've got a lofty goal you want to start taking steps all the time. We try to set things up so that everyday there's something that you take a little step further. It's too easy to have huge goals that are so far off. You have to tie it to what can you do today," Carmack said. But Carmack admitted that his own rocket efforts have downshifted a bit of late. "It's gotten a little slower this last year since I got a little baby. I lost my Sundays." The expo spotlighted work underway to develop a New Mexico-based Southwest Regional Spaceport. Groundbreaking for the spaceport is to take place later this year. Along with New Mexico, other states are pursuing their individual spaceports. At this point in time, the hope is that newly emerging spaceports will work together, and not become too competitive too soon. That's the view of Patti Grace Smith, Associate Administrator for Commercial Space Transportation within the Federal Aviation Administration. "I think they should be in the developmental stage. They should be supportive of each others effort," Smith told SPACE.com at an earlier event at the New Mexico Museum of Space History in nearby Alamogordo. "It's going to be really important that these things come on-line with the traditional launch sites that we have in the country," she said. "As it evolves, I think spaceports will look a lot like airports do today...a mature aviation system. It will naturally be complimentary...but competitive nevertheless as they build jobs, cottage industries around their launch sites," Smith said. Smith said she has a vision of spaceports of the future, and how they connect with each other. Point-to-point hops between spaceports should not be considered unrealistic in future years, she concluded.